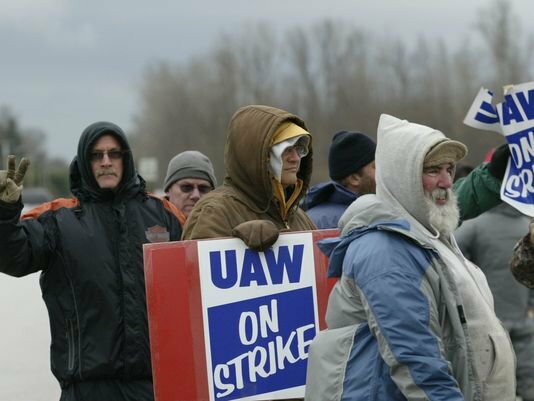 In a courageous stand against the multibillion-dollar Kohler Company, about 2,100 members of United Auto Workers Local 833 went on strike Nov. 15 immediately after a 94 percent membership vote to reject a concessionary tentative agreement. Pickets went up immediately at plant gates in the company town of Kohler, Wis., and other nearby plants. Workers at Kohler produce sink, shower and toilet fixtures as well as generators. This latest strike continues a long, militant history of the fighting workers at Kohler. In 1934, two workers were killed and hundreds injured on a picket line after a police riot. From 1954 to 1962, Local 833 members went out on one of the longest strikes in U.S history. The last strike at Kohler was in 1983. The membership’s main grievance in this contract battle is Kohler’s intent to keep a two-tier wage system in place. Two-tier wages were rammed through in a 2010 contract that had other major concessions, including skyrocketing health care insurance costs. For the first time in this union’s history, the last contract included two-tier language for “Tier B” workers that make at least $10 less an hour than “Tier A” workers. The wealth that Kohler rips off from workers increased over $5 billion during the last five-year contract. On Nov. 16, UAW Local 833’s members, their families and community supporters flooded Kohler with their bodies and righteous anger, marching from the Emil Mazey Union Hall to numerous picket locations. The Kohler company locked all plant gates except one, so hundreds took to the streets and traffic was backed up for miles in all directions. On Nov. 17, a Sheboygan County judge issued a temporary injunction against UAW Local 833, barring Local 833 members from “interfering” with traffic near Kohler property. 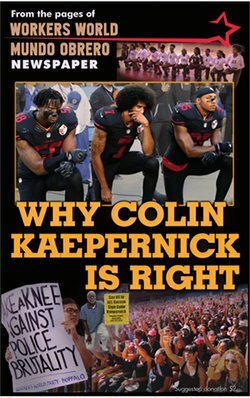 The judge issued no orders against Kohler, to, for example, stop Kohler from preventing the workers from making a living wage and feeding their families. Also on Nov. 17, many guests of the American Club, a five-star hotel owned by the Kohler Company, canceled their reservations early on because they alleged that loud horns had kept them awake all night. Pickets remain strong and UAW member reinforcements and others are arriving by the hour. “As an organization of rank-and-file autoworkers, we want to salute you for rejecting Kohler Company’s insulting contract offer. Two-tier wages and benefits sap worker solidarity, which is absolutely vital as we work side-by-side,” reads a Nov. 18 statement by the Autoworkers Caravan, a group of rank-and-file UAW activists fighting two-tier and other attacks at the Fiat, Ford and GM. Other labor and community organizations nationwide are building support for UAW Local 833, including Amalgamated Transit Union Local 998, Defeat Right to Work in Wisconsin, Fight For $15 Wisconsin, Fightback News, Moratorium NOW in Detroit, the Overpass Light Brigade, the People’s Power Assemblies, the Wisconsin Bail Out The People Movement, Workers World Party and many others. 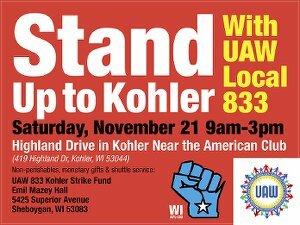 A mass picket sponsored by UAW Local 833 and supported by the Wisconsin AFL-CIO and a growing number of community organizations is scheduled for Nov. 21 from 9 a.m. to 3 p.m. at the Kohler Company headquarters, 419 Highland Dr., Kohler, Wis., 53044. For more information and to aid the strikers, see www.wibailoutpeople.org.